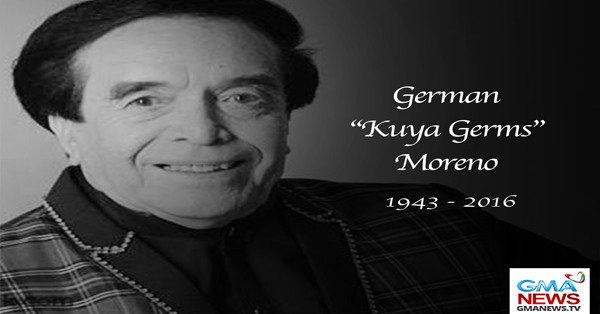 JUST IN: Master Showman "Kuya Germs" Passed Away at the Age of 82! German Molina Moreno, also known as Kuya Germs or the Master Showman, was a Filipino television host, actor, comedian and talent manager popular during the 1980s. The ever popular and one and only Masters Showman Passed Away Friday, January 08 2016 at the age of 82. It was confirmed by his relatives through a phone call to GMA News Online. Details for the said death of the legendary artist is to be released by his family. On January 2015, the Late actor was confined at the hospital for stroke and he needs few months for his recovery. 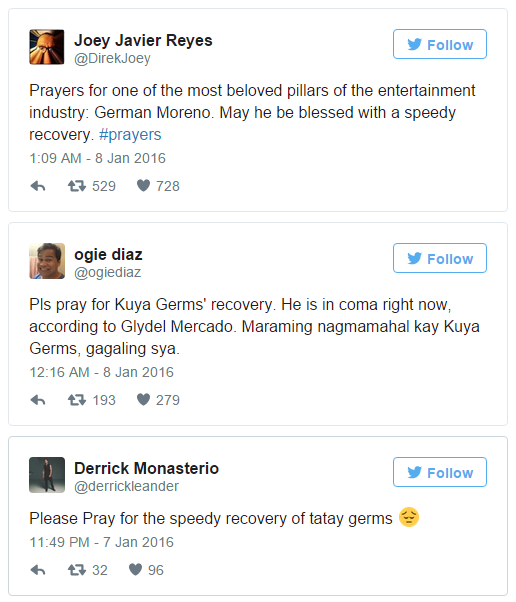 He was flooded prayers and support from his Friends in the Showbiz industry, No one ever had an idea that this year will be his last. Moreno became involved in the entertainment industry working as a janitor and telonero (curtain raiser) of Clover Theater. He later went on to pursue a career as a comedian of the bodabil stage and the post-war screen. His biggest break came on television in the late 1970s when he became host of the Sunday noontime variety show, GMA Supershow. May your soul rest in peace Kuya Germs. Age of 82 not 72! Please fix your article.